BJP president Amit Shah completes three years in office today, a period that has seen his party rapidly expand base through some deft political manoeuvres. A master strategist, the BJP chief is Prime Minister Modi’s alter ego, and the two have together given the saffron party political sinews it couldn’t imagine before 2014. A blend of Modi’s mass appeal and Shah’s organisational skills and sagacity has resulted in BJP having 13 states under its belt and is in power in five more with alliance partners. A five-term MLA, Amit Shah was appointed BJP chief in July 2014, but the party’s national council ratified the decision on August 9 that year. 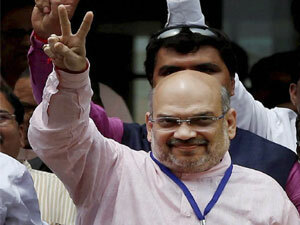 If growing public support for a party is a measure of its chief’s popularity, Shah is the most successful BJP president. Under him the BJP has not only won most elections it contested, it has also seen its vote percentage rise even in the polls it lost, like in Bihar. Barring Bihar and Delhi . The BJP juggernaut rolled on forming its maiden governments in Assam, Haryana and Jammu & Kashmir. Under him, the once ‘Brahmin-Baniya’ party, has reached out to the backward classes and Dalits, a strategy that paid rich dividends in Uttar Pradesh, India’s politically most important state, where it pocketed 73 of the 80 Lok Sabha seats, after a gap of 15 years. Under Shah, the BJP jettisoned its oldest ally the Shiv Sena in Maharashtra and contested Assembly polls on its own, emerging as the single largest party. The two parties are again together now, both in the state and at the Centre. In states like J&K, Assam and Manipur, the BJP has tasted power for the first time. In Goa, where it finished second after Congress, BJP cobbled together a majority and form a government with smaller parties. In Arunachal, the party engineered mass defection from People’s Party of Arun­achal Pradesh MLAs to form its own government. The BJP also notched more than ever vote share in local bodies polls in Odisha, Kerala and Bengal, sta­tes which Shah has mar­ked out as potential growth regions for the 2019 Lok Sabha polls. The BJP claims to have become the largest political party in the world with over 11 crore members, in which Shah’s strategies of meeting people and the office bearers on the first and third Monday of every month, and efforts to communicate directly with functionaries acr­oss states played a big part. In his 4th year at the helm of BJP, Shah is all set to make his debut in Parliament as a Rajya Sabha member from Gujarat. On an average, he has travelled 541 km daily as he held rallies and events across the country.